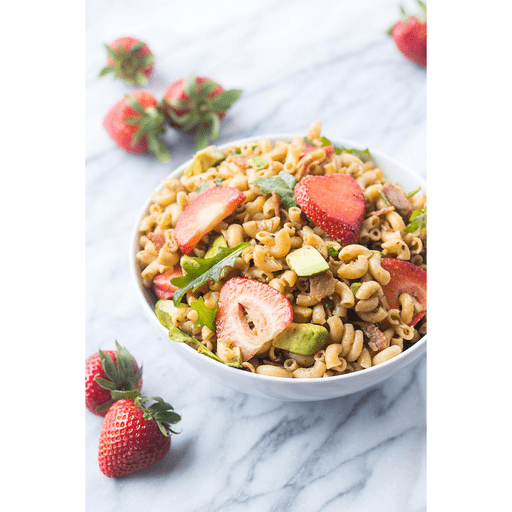 Creamy avocados, sweet strawberries and whole grain pasta tossed in a light balsamic vinaigrette make for one delicious and nutritious side dish. In fact, we think this Strawberry Avocado Pasta Salad may just be the perfect warm-weather salad! 1. Bring a large pot of water to a boil. Add pasta and cook. When pasta is al dente, drain pasta and rinse with cold water to cool. If making pasta ahead of time, toss with olive oil to help prevent from sticking. 1. Meanwhile, in a small bowl, add balsamic vinegar, olive oil, Dijon mustard, honey, dry basil, salt and pepper to taste. Whisk until mixture is combined and the oil and vinegar no longer separate. Set aside. 1. In a large bowl, add pasta, arugula, strawberries, bacon and garlic powder. Using a spoon, mix all the ingredients together. 1. Add in the avocado and drizzle with balsamic dressing. Gently toss everything together until combined. Serve immediately. For gluten free: Use gluten free pasta in place of whole grain pasta. For vegetarian: Omit bacon. Calories 230, Total Fat 9g (Saturated 1g, Trans 0g), Cholesterol 5mg, Sodium 170mg, Total Carbohydrate 35g (Dietary Fiber 2g, Sugars 6g, Includes 3g Added Sugars), Protein 5g, Vitamin D 0%, Calcium 0%, Iron 6%, Potassium 4%. *Nutritional values are an approximation. Actual nutritional values may vary due to preparation techniques, variations related to suppliers, regional and seasonal differences, or rounding.